Throughout the years we have worked with thousands of businesses across Southern California, and one of the many things they all have in common is document shredding is critical to the protection of their business information. The truth is document shredding provides any business the peace of mind that confidential information is no longer accessible, but that doesn’t mean we haven’t seen or heard several myths about the document shredding process. 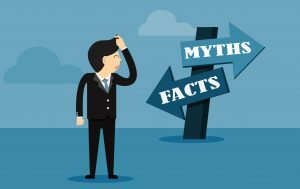 These 5 myths have been the most common we’ve encountered and we’re here to tell you they simply aren’t true. Many businesses we consult with think this is the most cost-effective solution for them. Unfortunately, that is not the case. What businesses tend to forget is that after the initial purchase of an office shredder, maintenance is often required which is another cost incurred a few months out of the year. In addition, employees’ wages as they shred add to that cost of shredding in-house. Considering that a full box of documents typically takes hours to shred with an office shredder, partnering with a certified shredding partner becomes the clear and smart choice. Let’s face it, the time and energy it takes an employee to shred information often becomes a hindrance in them performing the task. Employees are more concerned with getting duties they are assigned accomplished on schedule, making document shredding a very low priority. On top of this, monitoring employees to make sure the proper disposal of information is taking place becomes a job in itself. If document shredding within an organization isn’t prioritized it often leads to stacks of paper piling up, which in turn could lead to employees simply throwing away the information to quickly clear up the mess. We know you are trying to do the right thing and reduce the carbon footprint we leave for future generations, but unfortunately recycling paper containing confidential information does not meet the legal requirements for proper document destruction. Paper is sorted and sifted through at recycling plants and the information contained on each piece is accessible by anyone, thus not complying with the law. A certified shredding vendor however, shreds all confidential documents and then recycles the paper material, which is then re-purposed. While we are more than happy to have you witness your company’s documents being shredded right in front of your eyes, there is no legal requirement for you or your team members to do so. Many times, you and your employees may be busy performing your normal work duties and feel that to ensure the confidential information is indeed destroyed you must witness the process. Rest assured, that partnering with a reputable and secure shredding vendor fulfills your obligation and ultimately results in the receipt of a Certificate of Destruction, providing proof your business has met its legal requirement should an audit occur. Avoid the confusion surrounding document destruction and focus only on the facts. The process doesn’t have to be complicated and can take as little as 20 minutes to get you on track to compliance. Contact us to learn more about how partnering with a certified document and hard drive shredding vendor can make your office efficient, cost effective, and secure.